Start checking in and earning badges without even leaving the browser! 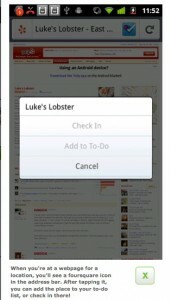 We’re pleased to recommend foursquare’s mobile add-on for Firefox. 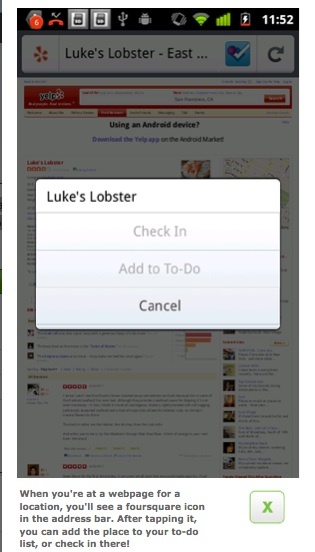 With the Foursquare add-on, you can add places to your foursquare to-do list, or easily check-in from within your browser. foursquare helps you explore the world around you. Keep up with friends, get insider tips, and unlock discounts and rewards wherever you go. All good stuff. Speaking of checking in and earning badges, follow @foursquare, @mozmobile and @coolhaus while we take on the Big Apple Thursday, April 28-Sunday, May 2. The Firefox Gone Mobile Ice Cream Truck will be in secret and surprise locations around NYC from 12-4pm each day. Come by, check-in and earn an awesome badge and sweet treats!